The "Octavia" is a pure 100% analog and hand-build effect pedal, which creates exactly those famous fuzzy and ring-modulated octave-up sounds Jimi Hendrix worked so often with. Also Jeff Beck and Stevie Ray Vaughan integrated that special effect sound with pleasure in their music. Following the tradition of this certain class of octaver/fuzz pedals, the Vahlbruch "Octavia" employs a custom-made transformer and new old stock germanium components for the authentic reproduction of this famous sound on a top-notch quality level you have never heard before! The "Octavia" is quite easy to use! There are just a "Boost" and "Volume" knob and a "Octa/Fuzz" toggle switch. Used before an already cranked up amp (or overdrive pedal) a "Boost" setting up to 12 o´clock is recommended in order to create the octave-up effect most impressively in the "Octa" mode.The "Volume" control is meant to define the pedal output volume. When the toggle is switched to "Fuzz", the Vahlbruch "Octavia" can be used as a fuzz pedal only - without the octave-up effect. The "Boost" knob adjusts the fuzz intensity in this mode. Thanks to its extremely large signal-to-noise ratio the Vahlbruch "Octavia" shows extremely low background noise and is therefore suited for any studio work and professional live performance. The pedal has a true bypass switch for perfect signal transfer without any tone loss. An amber LED shows you the on/off status. You can use a 9V battery to power the pedal or an external standard 9V power supply (ring +, tip -). The power consumption is approximately 10mA. 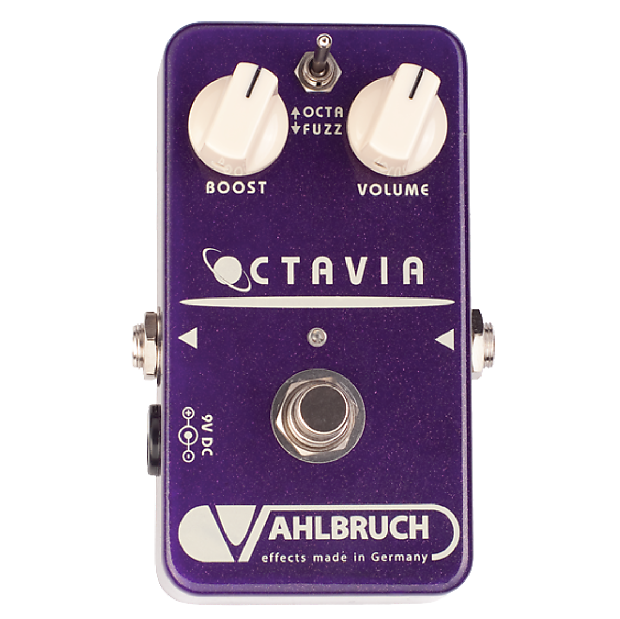 Like all Vahlbruch pedals the "Octavia" is hand-made utilizing only the best components available worldwide for high-end tone and years of trouble free operation.